This tutorial was first published as “Skinner Blend Flowers” by Valerie Creations. 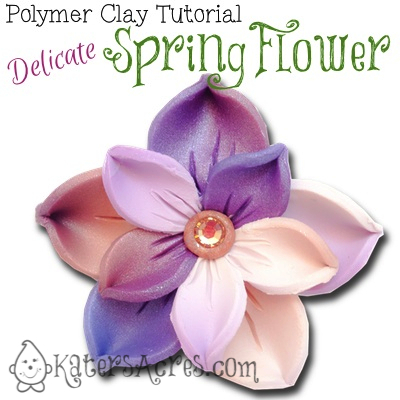 Spring Flower Tutorial: Make a Delicate Spring Flower from Polymer Clay http://t.co/XRXuLCY5Wb One tutorial, many colors, lots of flowers. Choose your colors and create a blend using either teardrops or triangles of clay. NOTE 1: I used 4 colors that I blended myself: blue sunset, peacock purple, rose gold, white, & a tiny pinch of peacock purple (which looks almost pink by the end). NOTE 2: It helps if you make a coordinating blend, this will give much more beauty to your flower overall, rather than just picking colors that might not look as “uniform” when blended. Create a blend by running this sheet through your pasta machine 15-20 times. Roll out on a medium-thick setting of your pasta machine (#3 on my Atlas). TIP: The more times you run it through your pasta machine, the clearer & more blended your sheet becomes. Once your sheet it blended, use two different sized cutters and cut out petals for your flower. NOTE: Decide on the amount of petals per flower first. I wanted each of mine to have 5 petals both outside & in the center. So I cut 5 large petals & 5 small petals. Remove all your petals from the sheet. Use the scraps to create a backing to adhere your petals to. Take a petal and place it in the palm of your hand. Using a large ball tool, roll it over the surface of the clay, this will give the petal a natural “bend” to it. Is it big enough to hold all my petals? If not, get more scrap or flatten it further. Did I make enough or too many petals? Picture your end result, how will your flower look? Next take the rest of your large petals and roll the ball tool over them. Gently pinch your petals for a more realistic look. Center them over your scrap clay. Use the center of a ball tool to gently adhere all the petals together and to the backing as well. Repeat the same process for the smaller inside petals. Use a needle tool to add details to the center of your petals, both large & small. Add a pinch of coordinating color of clay in between all the petals & add a Hot Fix, Flat Backed Crystal for pizazz! NOTE: For extra sparkle, add a Swarovski hot fix crystal as shown above. Bake in your polymer clay oven, covered, for no less than 40 minutes. This longer baking time will create strength for your piece. My tutorial is different from the original flower tutorial in several ways: the first is that I’m using more than the 2-3 colors the original artist used. In addition, she uses a giant leaf cutter for her flowers, which I found made my flowers too large. Additionally, hers have the added center strings & beads. Mine use Swarovski embedded straight into the center of the flower, or dangling off a center loop. DISCLAIMER: As you can see from the above information, this tutorial did not in any way shape or form originate with me, but to the best of my knowledge was first written by Valerie Creations. If this tutorial was written prior to Valerie’s publication, I apologize for not being able to give proper credit. Beautiful Katie! Thanks for sharing! Thank you so much for the mention Elaine! I’ve been so addicted to making flowers lately. Hi Katie, That you for fixing my subsciption to your wonderful site. I’m glad you are subscribed now. I do my “seasons” here on the blog according to the “seasons” we have here in the stats. My email newsletters are often random and not as season oriented. Thanks for subscribing!